Charlotte (Germany) and host sister Jewel (left) used teamwork to bring their team accolades. 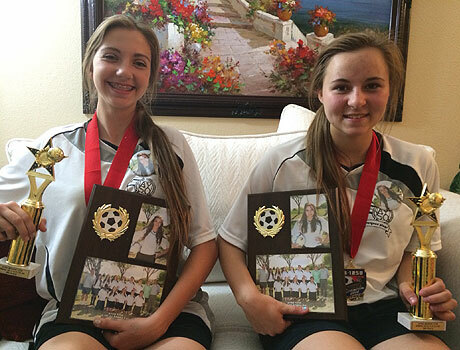 Charlotte and her host sister Jewel have been playing soccer on the same league team since February. Besides winning third place in the championships, which gave Charlotte her first sports trophy and framed team pictures, Charlotte has gained athletic skills and enjoyed being part of a supportive and encouraging soccer team. Above all, she found playing soccer with her host sister to be an easy and fun way to bond with her host family. Two practices and a Saturday game every week have given the Steffens and Charlotte many opportunities to get to know each other outside of the house. What a great way to end the year!